A grassroots Non-Governmental Organization, the David Umahi Nweze Akubaraoha Ebonyi Transformation Agenda (DUNAETA) has hailed the election of Ebony State Governor, Engr. 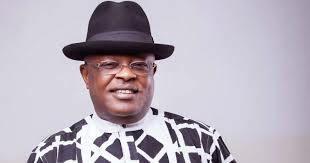 Dave Nweze Umahi as Co-Chairman of the Southern Governors’ Forum, Fresh Angle International can report. “This recognition once again proves our stand that Governor Umahi has brought a new positive dimension to the politics of Nigeria”, President and founder of the NGO, lady Monica Chidinma Eze declared in a statement. The Governors of the Southern States of Nigeria at a recent meeting in Lagos where Governor Umahi was elected as co-chairman of the forum, unanimously reiterated the call for true federalism and devolution of powers to States and also resolved to collaborate with one another for the growth and development of their economies.